Have you ever been curious about what it is like to travel alone to exciting locales such as India, Egypt, Belize, and China? Experience one woman's thirty-year-long traveling adventure in the audio book, Tattoo: Journeys On My Mind by Tina Marie L. Lamb. Go on the trip of a lifetime and travel around the world to encounter the exotic and not so glamorous adventures of a single traveling woman on a mission to live her life to the fullest. Experience the cultural differences of Japan while trying to fit a whole piece of sushi in your mouth, get lost miles away from your destination in China, and almost get kidnapped while visiting India. Trek through the jungles of Thailand and learn how cone hats are made, then train with a dogsled team in Minnesota. Enjoy listening to the author's unique perspective on each country she has explored, peppered with her excellent sense of humor and thinly disguised Bostonian accent. 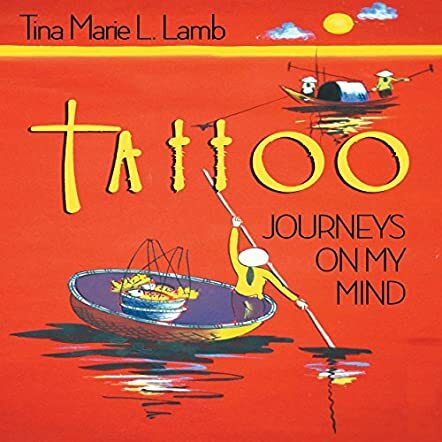 With over thirty years of experience traveling around the world, there is much to discover in the fascinating traveling audiobook, Tattoo: Journeys On My Mind by Tina Marie L. Lamb. The author's stories are interesting from the start, drawing the reader in, and taking them on fun, sometimes dangerous adventures that make the reader thrilled and hungry for more. I appreciated how the author included food into her experiences along with her daily interactions with people from vastly different lifestyles and religions. I enjoyed this book and sharing the author's experiences. I would recommend this book to those that love to travel or enjoy armchair traveling.